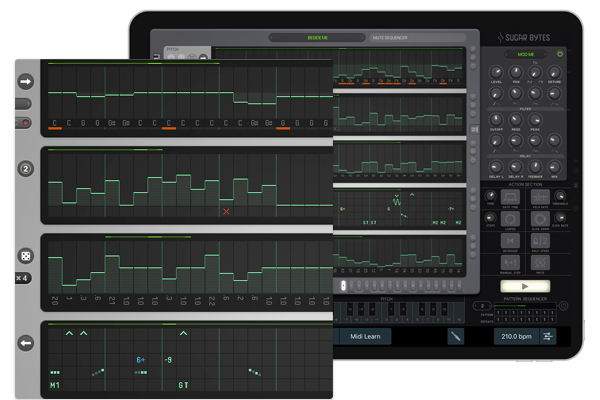 Thesys for iPad | Pitch Sequencer with vast MIDI out capabilites. 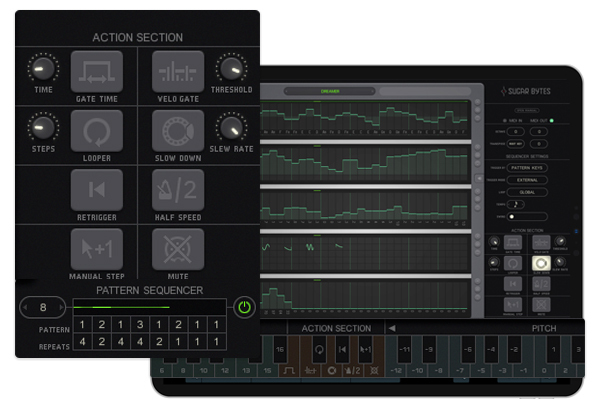 At its core, Thesys is a step sequencer. In fact, it's not just one but five, each covering a different type of MIDI data and all running alongside each other. 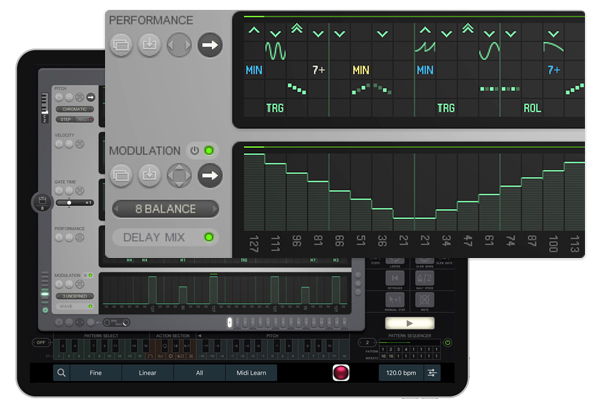 Sequencer Controls include: Pitch, Velocity, Gate Time, Octave, Pitchbend, Chord, Retrigger, Randomisation and Modulation. The sequences can simply be painted, but with the random generator and the mutate-function you can easily generate patterns on the fly. Or record the pitch straight from your MIDI keyboard. The internal synthesizer saves you lengthy wiring sessions so you can start straightaway. Start by setting the root note. When using the scales, no out-of-key note will slip through your fingers. Below the pitch lane, you'll see the Velocity (volume) and Gate Sequencer (controlling each note's length). It's in these top three sections that you'll spend the most of your time, programming riffs and arpeggios, then assigning them to patterns. The fourth step window is home to the Performance Sequencer, which is in fact 5 sequencers in one. 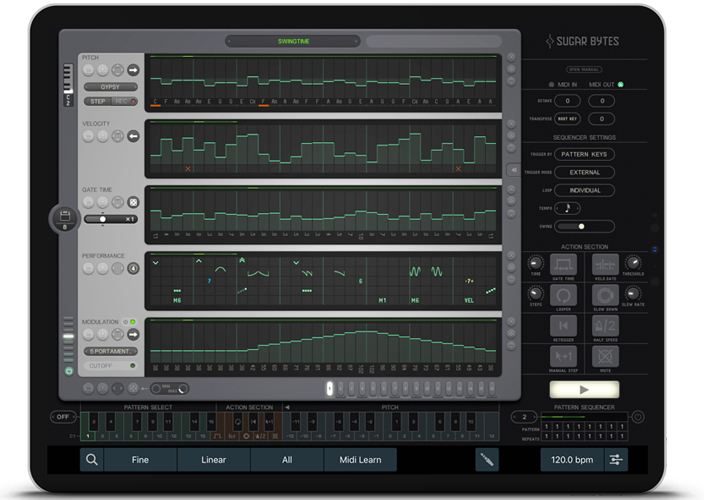 Each row offers per-step control over Octave, Pitch Bend (with 20 pre-configured shapes), Chord (for polyphonic sequencing), Note Roll and sequence randomization of a vast range of other cleverly implemented "humanizing" elements to your patterns. The final lane is the CC modulation section: each step accepts a value of 0 to 127, pumped out to a MIDI CC of your choosing. You can actually run several Modulation sequences simultaneously - up to eight - with all of them controlling different CCs. Up to 16 full patterns can be created within a single project. They can can be sequenced within the Pattern Sequencer (bottom right) or triggered via the Keyboard (set to "Pitch"), where the full length of the keyboard is used to transpose the current pattern. Switch to "Performance" and the keyboard is split into 3 zones: Pattern Select, Action Section and a Range for pitch transposing. The “Action Section” offers 8 effects that can influence the patterns in real time. Choose from Looping, Half-Time, Re-Trigger or a Tempo Break. The lanes within a single pattern can be set to operate over different lengths. You could have pitches cycling over 16 steps, while velocity cycles over 15 steps and a modulation lane is used to sweep a synth filter over 29 steps. The end results can yield some fascinating interactions between these different step-cycle lengths and an almost endless evolution of the pattern. If you thought step sequencers were only capable of creating repetitive fixed patterns, think again! 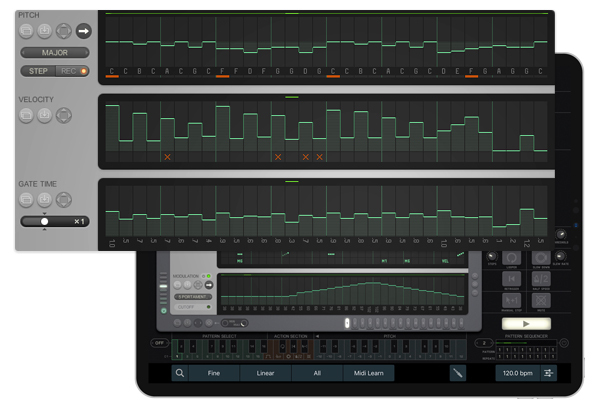 Yes, Thesys also comes with its own synthesizer, it is perfectly capable and very useful if you just want to develop a few quick ideas. 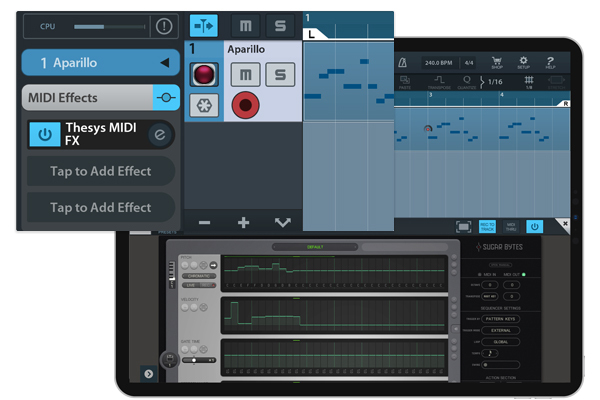 No other MIDI sequencer offers you the ease and power of Thesys. It is 100% MIDI compliant - the ultimate MIDI sequencing solution. Use Thesys on your iPad to control multiple apps or external hard- and software! Send melodies, controller data and program changes. Save patterns to a MIDI file.